At Choonara Orthodontics, Dr. Choonara and his hardworking team are proud to provide children, teenagers and adults living in Johannesburg, Randburg, Sandton and the surrounding areas with high quality, personalized orthodontic treatment. Considering the popularity of orthodontic treatment using clear, removable aligners, it’s likely that you’ve already heard about the remarkable Invisalign System that helps patients achieve their best smiles discreetly, conveniently and comfortably. As a leading Johannesburg Invisalign Diamond provider, Dr. Choonara has proven he has the training, expertise and experience needed to improve smiles using this very innovative and effective orthodontic treatment method that uses no metal wires or brackets. For our teenage patients who would like to enjoy all the benefits that Invisalign offers, we offer Invisalign Teen which is very similar to regular Invisalign but with a few key differences. Invisalign Teen consists of a series of custom-made, removable, transparent aligners which are designed to gradually move the teeth into their optimal positions by applying consistent pressure to the teeth. The aligners which are made of a clear, thin plastic material, fit snugly over the teeth. Each set of aligners is worn for about two weeks and then replaced with the next set in the series and so on until all the aligners have been used and the teeth are in the correct alignment. Even though standard Invisalign is very effective at moving teeth, this treatment option was not recommended for teenagers when it was developed for two main reasons. First of all, it was thought that teens would not always be compliant with wearing the aligners for the recommended 22 hours per day. Secondly, since many teenagers still have permanent teeth erupting from the gums, the precisely planned movement of the teeth could be disturbed with standard Invisalign aligners. 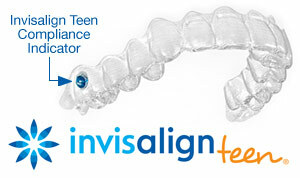 For these reasons, Invisalign Teen aligners are different than regular Invisalign aligners. To address the first problem with patient compliance, Invisalign Teen aligners come with discreet, built-in “compliance indicators” which are tiny dots that fade over time as the aligners are worn in the mouth. This feature lets your teenager, you and your orthodontist know that the aligners are being worn as directed. And to solve the second problem, Invisalign Teen aligners have “eruption tabs” built in which hold the space needed for non-erupted teeth. Very Discreet Treatment – Since the aligners are clear, they’re virtually invisible which means your teenager can discreetly improve his or her smile, which is something most teens really appreciate. Comfortable to Wear – Since the aligners are made of a smooth plastic material, there is nothing present that can poke and irritate the inside of the cheeks and lips. No Food Restrictions – When regular braces are worn, there are many types of foods which must be avoided as they can bend, damage or break the wires and brackets on the teeth. But since Invisalign Teen aligners are designed to be removed when eating, your teenager can continue enjoying all their favorite foods including hard, crunchy, sticky and gooey foods. Easy to Maintain Good Oral Hygiene – It is very easy to maintain good oral hygiene when wearing Invisalign Teen as the aligners are designed to be taken out when brushing and flossing. Fits Seamlessly with Your Teen’s Active Lifestyle – Invisalign Teen has been designed to perfectly mesh with the active lifestyles teenagers lead. With no wires to adjust, your teenager will enjoy having fewer orthodontic appointments. Your teen also can continue doing all the things he or she enjoys doing like playing sports or being in the band. And since it’s easy to clean the teeth by simply removing the aligners, your teen never has to worry about developing tooth decay or other dental problems due to it being difficult to brush and floss. 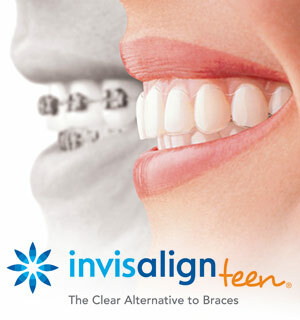 For the best results with Invisalign Teen, it’s important that your teenager takes good care of his or her aligners. Your teenager should not drink hot beverages with the aligners in as doing so can warp the aligners to make them unusable. And since heat can distort the aligners, your teen should never set the aligners on a radiator or other heat source. To clean the aligners, your teen only needs to brush the aligners gently using a toothbrush, toothpaste and cool water at the same time they’re brushing and flossing their teeth. You teen should not chew gum when wearing Invisalign as it will stick to the aligners to make a big mess. On the day your teen starts wearing Invisalign, we will provide him or her with complete aligner care and cleaning instructions. Contact Your Johannesburg Invisalign Provider! If your teen would like to improve his or her smile discreetly and comfortably with Invisalign Teen, please call (011) 678-8090 or request an appointment with Dr. Choonara today. You can also reach out to us through our contact page. Once your teen has a thorough examination, Dr. Choonara will discuss his findings with you and your child along with your teen’s treatment options which may include treatment using Invisalign Teen clear aligners. We look forward to meeting you and your teen soon and welcoming you to the Choonara Orthodontics family where we give our patients lots of reasons to smile!